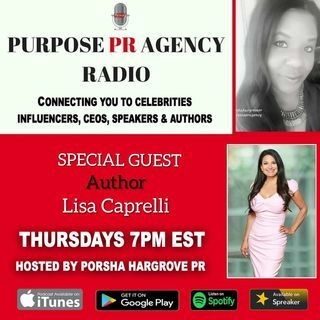 Porsha Hargrove PR has an inspirational conversation with Author Lisa Caprelli. This episode gives hope to the writers who are listening to tonights episode. Lisa talks about her 4 published books and touches on information on how to become self published. We speak on the importance of moving forward with your dream of being an author, self love and self care. Lisa introduces the listener to her new venture in writing her first childrens book! We also discussed the importance of having a ... See More Publicist.